On Sunday, I had the pleasure of meeting and working with 6 wonderful College students from Champlain College. 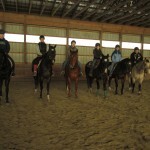 The students have joined our Equestrian Club that we offer here at Erin Longworth Performance Horses. The students get to experience hands-on what life is like at our barn. They help with basic everyday chores such as mucking stalls, turning horses in and out, watering, and feeding. 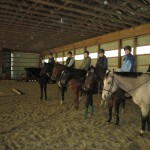 Our Club is for every level; for students who have never seen a horse before to the students who have been taking lessons for years. Laura rode Artie, Devry rode Tucker, Angela rode Scotty, Nichole rode Luka, Ashley rode Chipper, and Jenn is on Goose. 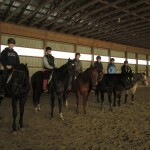 If you attend Champlain College and you would like to join our Equestrian Club please contact us!